I have to say I wasn’t sure what to expect from the posts and recipes my friends would share with me about their loved ones they lost. 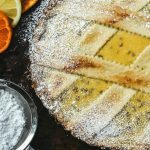 I knew the posts would have delicious recipes, because every blogger I’ve shared here so far is very talented. The stories left me in complete wonderment; a joyful wonderment. The wonderment of awaiting the arrival of a sweet surprise. One of the first people to respond to my request to participate in the series was Renee, from Magnolia Days. If I told you she had her story written, cake baked, and had it all sent to me within a matter of days, I would not be exaggerating. Renee is amazing. She is kind and forever helpful. Everything Renee does is done with care and attention to detail. 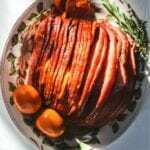 Renee’s blog is full of delicious recipes. 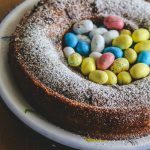 Some favorites of my favorite recipes of are hers are her: apple strudel, dulce de leche bundt cake, and her cheddar jalapeno sourdough bread. When you pop over to her blog you will see for yourself! With Thanksgiving fast approaching, I am feeling that deep nostalgia for my dad. I am also feeling ever so grateful for my friends and my family. I am grateful for my friend Renee taking the time to share a memory of her dad and bake the most beautiful coconut cake. I have to say that coconut cake was a favorite cake of my dad’s, as well. 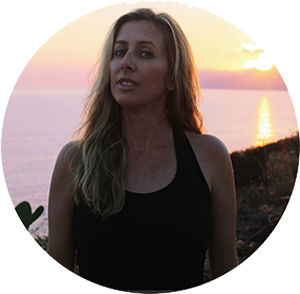 So let’s not wait a second longer…here is my friend Renee and her story. Hello! I’m Renee from Magnolia Days. You may have seen me mentioned a few times here on this lovely blog. I’m one of the regular participants in Lora’s Bundt-A-Month and Twelve Loaves challenges. It’s been such fun to be a part of groups filled with passionate bakers. I was honored when Lora asked if I would contribute to her “Food Memory” series she started after receiving a great response to the tribute to her father in her post “An Italian Cake and Grief”. Food memories and my dad – the two are so connected and intertwined for me it is hard to think of one without the other. I grew up watching my dad cook, grill, garden, fish, and enjoy the simple pleasures of it all. I remember riding on the tractor with him as he tilled the garden. There was the smell of the earth being churned up as the tines dug through the ground. It meant a few months later we would be stringing beans, shelling peas, husking corn, and slicing tomatoes. The garden would soon stop producing in the fall. Another season would be upon us and family discussions of holiday meals would arise at the table. After I became older and started baking the conversation always lead to the same suggestion. My dad would lift his fork, point it at my mom or me and say “you could make a coconut cake”. Oh how he loved coconut cake. The holidays would not be the same without it. We would make the same cake for him each time. It’s a recipe we got from someone (I forgot who) 30+ years ago. It was a simple one using a cake mix for the layers and then a mixture of sugar, sour cream, and coconut for the frosting. I had continued problems with the mixture on the top and sides of the cake. It never seemed to hold right. It usually dripped down and wound up as a puddle at the bottom. So I set out to change it up in a way I knew my dad would approve and to make the layers from scratch. The solution came with using a seven minute frosting for the top and sides and the mixture as the filling between the layers. An important note: this cake takes three or more days to make. You need to plan ahead. The filling needs to soak into the layers for three days before you frost the top and sides of the cake. 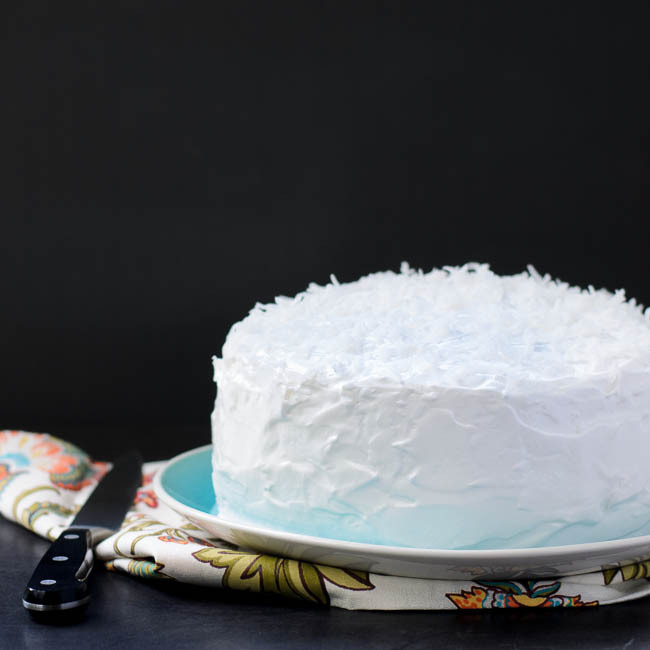 The result will be the most incredibly moist coconut cake with a fluffy frosting. I lost my dad two years ago. I miss him greatly and have such fond memories of him with food and so much more. I’ve written about my dad and shared some of his recipes on my blog. His cornbread and beef stew are two of my favorites. Thank you so much Lora for including me in your Food Memory series! I thoroughly enjoyed baking this cake and reminiscing over the times I enjoyed one with my dad. Thank you, Renee, for being a part of #FoodMemory. Your cake is stunning! You can find more of Renee on Facebook, Twitter, Pinterest and Google Plus. Heather from Girlichef and her Sweet Brown Butter Cornbread. Stir together coconut, sugar, and sour cream until blended. Chill. This can be done a day in advance. Heat oven to 350 degrees F. Grease and flour two 8-inch round cake pans. Note: You can also line the bottom of the pans with parchment for easier release. In a large bowl, cream butter and sugar until light and fluffy using an electric mixer on high speed. Add vanilla and beat to combine. Add eggs and egg yolk, one at a time, beating well after each addition. Add flour mixture in three additions, alternatively with milk in two additions, mixing on low speed until just combined. Do not over mix. Divide batter evenly into prepared pans. Bake for 30 to 35 minutes or until a toothpick or cake tester inserted in the center comes out clean. Cool cakes in the pans for 10 minutes. Remove cakes from pans and cool completely on a wire rack. Note: Wait to make this after the cake has chilled for three days (see assembly instructions). Bring about an inch of water to a simmer in a saucepan. In a heat-proof bowl (metal or glass), add the water, sugar, egg whites, cream of tarter and salt. Whisk to combine. Set bowl over the simmering water and mix with a handheld electric mixer on low speed. A whisk attachment works well however you can use regular beaters. Increase the speed to high and beat mixture until it holds stiff peaks, about 5 to 7 minutes. Remove the bowl from over the pan and set on kitchen towel. Continue to beat until mixture is cool, glossy, and billowy, about 2 minutes more. Beat in vanilla. Use immediately or refrigerate in a sealed container. Cut the cake layers in half horizontally to make 4 layers. Place one cake layer on a cake plate. Top with 1/3 of the filling. Repeat layers ending with the top layer of the cake (top and sides of cake are frosted later). Wrap or seal cake and refrigerate for three days. Frost top and sides of cake with seven minute frosting. Garnish with sweetened coconut flakes. I am so sorry that both of you have lost your fathers…but I love this series of food memories. Renee, your cake looks amazing! I could eat the whole thing myself!!! Oh Lora you are so sweet! Your kind words made my day. I am honored to be a part of this series and I cannot wait to see the ones to come. gorgeous gorgeous cake! I loved reading how you grew up "watching your dad cook, grill, garden, fish, and enjoy the simple pleasures of it all . . riding on the tractor with him as he tilled the garden." How sweet and special that is, Renee! Just warms my heart. . and what a lovely cake. . after waiting 3 days for the cake, a 7 minute frosting sounds just about right. Beautiful! Thank you for sharing, Renee! Wow, this cake looks so wonderful. I'm not sure I'd have the patience to wait for 3 days to eat it, but I'm going to have to try it soon! I simply LOVE coconut cake. 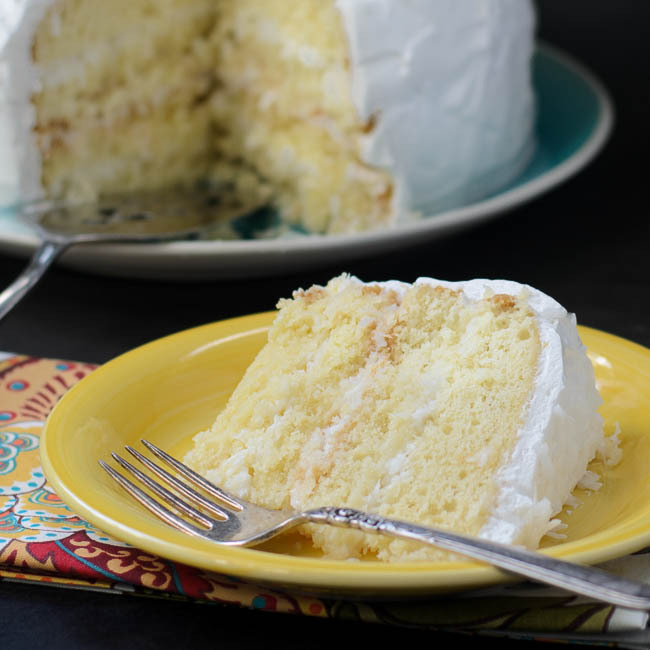 I've tried to make it myself twice using an ATK recipe, but it never turns out as good as the first coconut cake I ever had from the Curb Market in Montgomery, AL. Maybe your recipe will "take the cake" (sorry…not sorry). You all are choking me up over here. What a beautiful post and tribute to your dad, Renee. I remember reading Lora's initial post, Project Sicilia, and I don't know how I have managed to miss the posts in between. I truly believe that our loved ones live on through us and the traditions we continue honoring long after they are gone. Thank you so much for sharing your fabulous coconut cake and your memories of your father. What a beautiful cake! Also a lovely story. Food always connects us to the people that have meant the most in our lives. Thanks Alice! My dad was such a big part of my life and I have so many treasured memories of him. Thank you Stacy. I was tearing up as I was writing the post because I miss him so much. I think the holiday season brings up even more memories of our departed loved ones. Thank Laura! So true of how food connects us to people. It keeps memories of them alive. Thanks Liz and sometimes I think I could eat the whole cake too. It is quite scrumptious. Thanks a bunch Carly! And it is tough to wait 3 days on this cake although well worth it after you take a bite and see how moist it is after the filling soaks in the layers. Hopefully this one will be your coconut cake success. 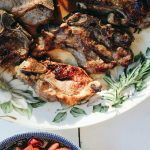 This is another incredible guest post for your Food Memory series, Lora. I adore Renee and she really delivered with the sweet memories she has of her father and this incredible cake. It's only fitting that it takes several days to make because it's truly a labour of love. And it looks absolutely dreamy! Thanks so much Kim and I could not agree more on how beautiful results comes from taking the time to make something with love. Thanks Nancy and it really was a labor of love. 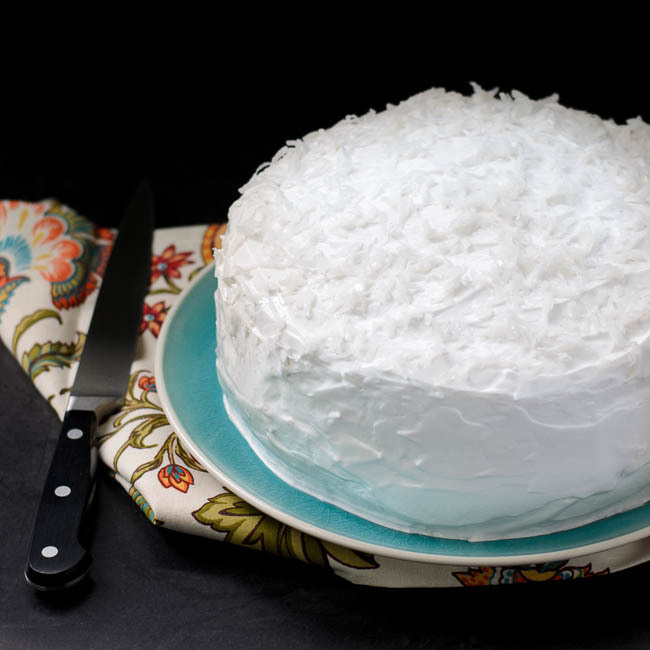 A coconut cake that has a filling soaking for 3 days is worth making! I've always been intrigued by the 7 minute frosting and should give it a try. No wonder your dad loved this cake so much! Beautiful post Renee.